Biological soil crusts are the feature of this USGS Canyonlands Research Station website. 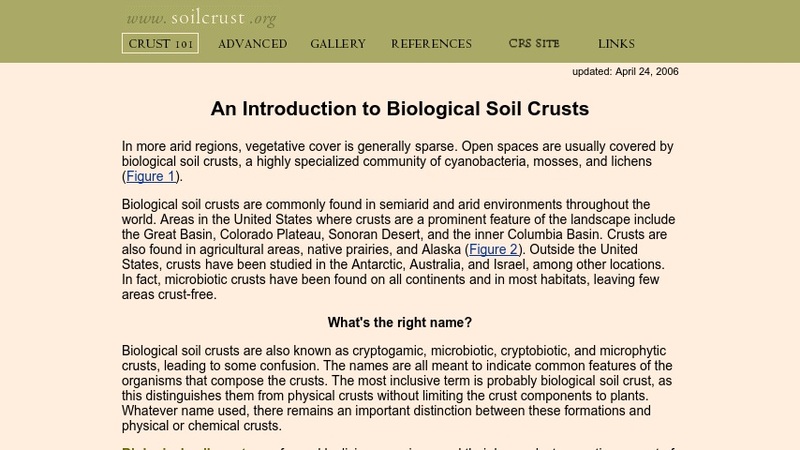 The site provides an introduction to biological soil crusts with linked images, divided into the following topics: nomenclature of the crusts- crytogamic, microbiotic, crytobiotic, and microphytic crusts, structure and formation, species composition, ecological functions, response to disturbance, future, and a glossary. In addition, the site provides links to other Canyonlands Research Station webages including an advanced page with a downloadable 90-page report on soil crusts, a gallery of biological soil crust images and figures, references, the Canyon Country Ecosystems Research Site (CCERS), and other related links.